Samsung has redefined mobile communication, defying the limits and constraints of design and technology. With the Galaxy S6 and the Galaxy S6 edge, Samsung has answered the growing demand of consumers for a beautiful smartphone with powerful features. Samsung is using new manufacturing processes to offer immaculate construction and top-of-the-line usability and functionality to produce proprietary technology. These techniques span all the way from authentic material handling to the last finishing touches. Samsung was the first company to introduce curved display phones, and now Samsung is elevating the possibilities even higher by combining beauty and purpose from the ground up. The curved design of GS6 edge was realized by 3D Thermoforming, a unique technology created and perfected by Samsung. This involves the insertion of glass between two molds, heating it to a pliable forming temperature of 800 degrees Celsius, and then allowing it to then be pressed into a symmetrical shape. In this process, the glass is shaped in three directions at once, giving it its curved shape. Until now, smartphones were equipped with 2.5D glass, which was carved to the desired shape. Though the display was flexible, the glass could not be bent. Therefore, previous screens could only be curved up to a certain degree. After 3D Thermoforming, the glass is perfectly processed with the highest precision machinery to avoid the slightest errors. 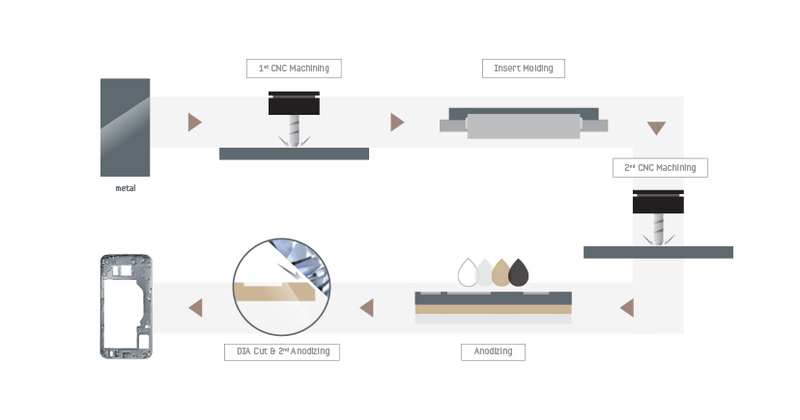 The Galaxy S6 and Galaxy S6 edge’s glass production procedure incorporates sophisticated steps to produce an elegant finish. 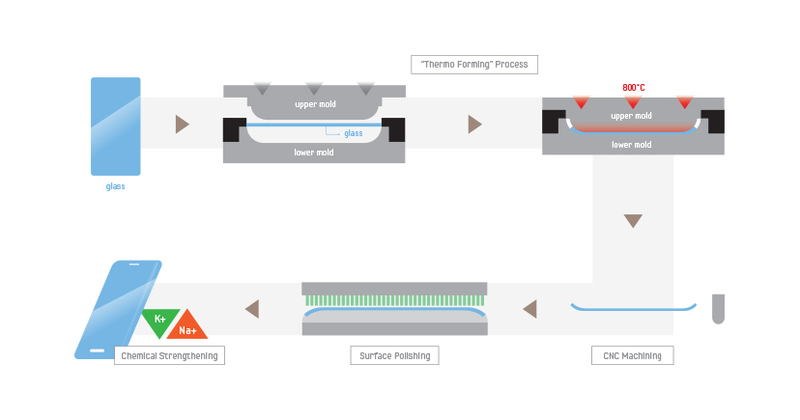 This multi-step process includes polishing the front, side, rear surface polishing glass. The luxurious feel of the high-gloss color on the rear casing is amplified by the nano-thin multi-coating process. The process of adding nano layers of multiple coatings gives the casing on both the front and back a rich, dynamic color that reflects light as it is viewed from different angles. Furthermore, the sleek and slim body shows off Samsung’s effort to provide the best technology, beautifully. In addition to the unique glass design element of the Galaxy S6 and Galaxy S6 Edge, just as much attention was given to the metal material. Existing smartphones normally use 6063 aluminum. The Galaxy S6 and Galaxy S6 edge are equipped with high-strength 6013 aluminum which is typically used in products that require extreme durability such as aircraft fuselages, automobiles, yachts, and mountain bikes. 6013 aluminum is 1.5 times stronger and 1.2 times more scratch-resistant than 6063 aluminum. Like true craftsman, Samsung has produced the sleek frame of this masterpiece using a process of more than 20 precise and delicate steps. Procedures that help provide texture and enhanced durability include precision machining from extrusion, molding to integrate heterogeneous components, diamond cutting on the metal covers and anodizing. Samsung combines functionality with beauty and durability in its new metal frame, introducing new technology for seamless communication, which is the principle function of all smartphones. After realizing the thickness of the metal frame ultimately impacts antenna performance, Samsung applied a technique to weld the antenna to the metal frame itself with ultrasonic welding for the Galaxy S6 and Galaxy S6 edge. This, makes the antenna more stable for the environment and resilient against external impact, while freeing up more internal space. In introducing innovation, not only in design and engineering, but also in manufacturing processes, Samsung adheres to its notoriously strict quality control policy. Each product undergoes intense durability testing such as drop tests, bending test and performance testing among many other steps. Samsung takes to ensure the highest quality products. By fusing together innovation with durability, Samsung is able to provide the level of quality consumers expect from Samsung.